The Real Estate Institute of Australian Capital Territory Awards for Excellence Gala Dinner was held this weekend. The ACT’s real estate sector came together on Saturday night to celebrate its achievements and recognise outstanding performers for 2018. 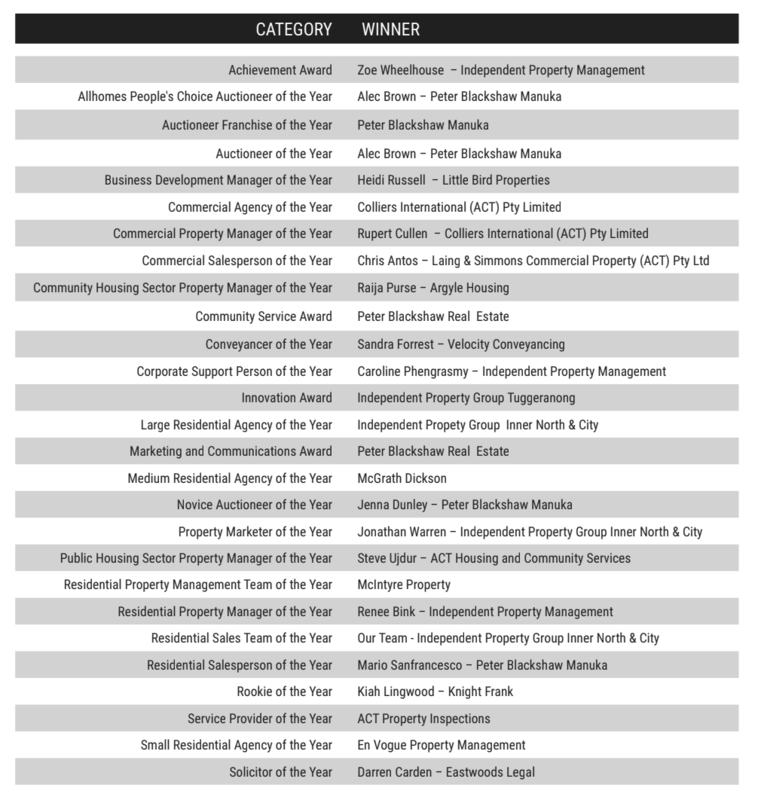 “Our annual Awards for Excellence are a chance to reflect on the contribution the real estate sector makes to the ACT and the professionalism and dedication of all the businesses and individuals working in this field,” said REIACT President, Michael Kumm. This year there were 27 award categories and over 380 people attended the Awards ceremony. Mr Kumm told WILLIAMS MEDIA the judges and criteria was set by the Real Estate Institute of Australia, and the judges were mostly from interstate. Each award is judged out of 100 points and all the winners will go to the national awards. Mr Kumm said the ACT is a country town growing up, and auctions weren’t always very successful. “The public in the ACT have become aware that auctions are the best method of sale, and the quality of our auctioneers are equal of other states in Australia." He said the competitive nature of the industry is what keeps it vibrant and alive. Peter Blackshaw took out many awards including auctioneer franchise of the year and auctioneer of the year going to Alec Brown. Mr Kumm, who is also a licenced agent at Peter Blackshaw, said Alec Brown is one of the most competent auctioneers he has seen. Alec was in the top two last year, and has been with Peter Blackshaw for six years. Mr Kumm said the novice auctioneer of the year, Jenna Dunley, also from Peter Blackshaw was a bit of a standout. Peter Blackshaw Manuka, which has been operating for 30 years, also won auctioneer franchise of the year. Peter Blackshaw himself has also previously won auctioneer of the year twice. Medium residential agency of the year went to McGrath Dickson. Director Christopher Dixon said there is always an element of surprise, but “we certainly had a high degree of confidence in the team and our achievements throughout the year”. In 2013 McGrath Dickson was inducted into the REIACT hall of fame, and from 2008-2012 won medium agency of the year. “I would certainly say our success over the years, not just this year, has come down to fantastic people that work within our team, and their desire to strive for six star service which is the McGrath philosophy," Mr Dixon told WILLIAMS MEDIA. Colliers International won Commercial Agency of the Year for the second year running, and Director Rupert Cullen was recognised as the Commercial Property Manager of the Year. Colliers International Associate Director of Investment Services, Matthew Winter said “It is a huge credit to both our commercial sales and leasing teams and their dedication to achieving the best outcomes for every client”. Colliers International Director Real Estate Management, Rupert Cullen also sees teamwork as fundamental to his individual success. “Without everyone's commitment and support I would not have even been nominated for this award, let alone have been named Commercial Property Manager of the Year,” said Mr Cullen.